Sitting in the raised hot tub overlooking the stunning pool and bar area of the elegant boutique resort, Rancho Pescadero, guests congregate in the hot, bubbly water. Many are here to surf during the day, while their spouses take a yoga class or sit in one of the “floating” chaise lounges in the pool with a cool hibiscus margarita. You don’t have to be a surfer to stay at this luxury boutique resort. Guests range in their mid-40s to -60s. No party animals allowed here. Just well-off people, ready to relax, eat great organic food, take long walks along the beach and surf. If you don’t bring your own board, the resort has a few to borrow. One of the staff members or guests will happily teach you a few of the basic skills to get started. Rancho Pescadero is located about 90 minutes from the Los Cabo International Airport. Guests can either rent a car at the airport or take a shuttle to the property for about $200 for up to six passengers. 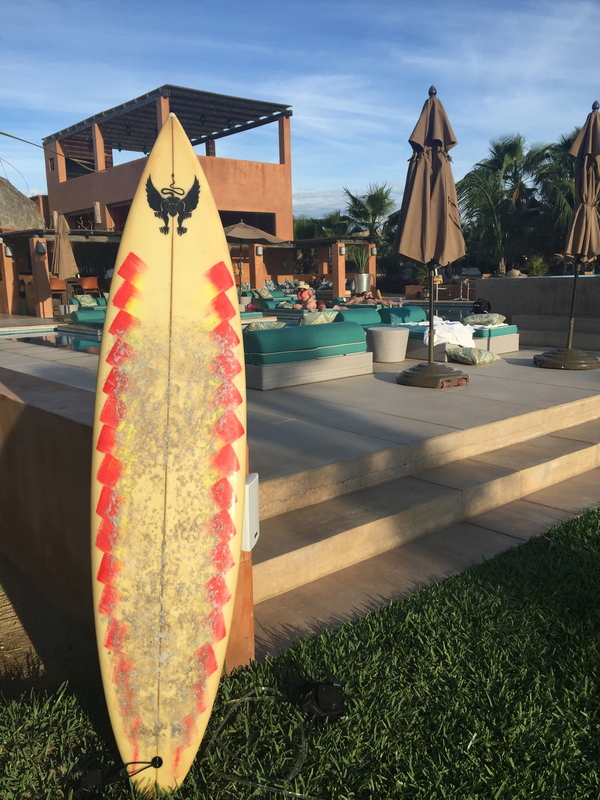 It’s located just south of the charming, artist colony/surfer town Todos Santos. Turn off the smooth Highway 19 onto a dirt road leading to the Pacific Ocean. There are 15 acres of organic gardens and sandy beach. 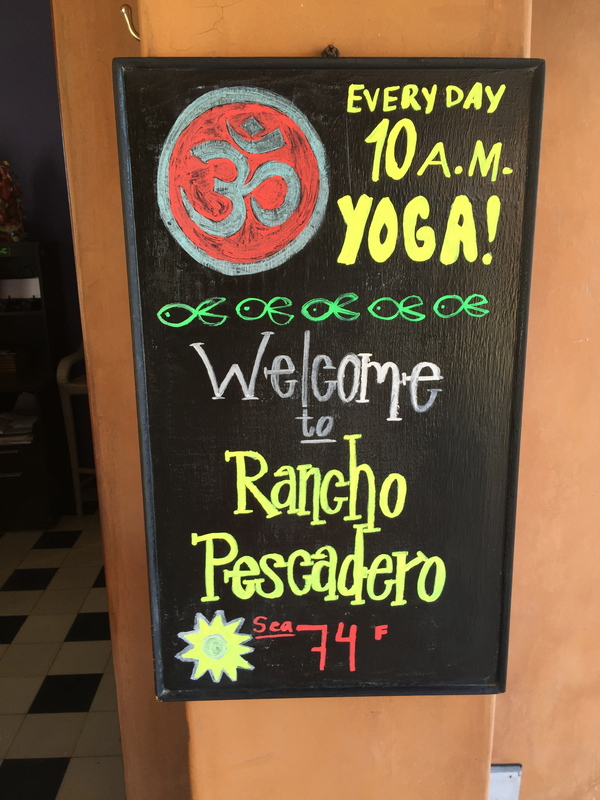 Rancho Pescadero has 28 unique guest rooms, two pools, a bar, Yoga studio and gourmet restaurant. Everywhere you walk, you’ll find beautiful views and hear the sound of the waves crashing onto the shore. Staying in the spacious room #14 for one night, I thought the designer kitchen was prettier than most homes. There was a grand living and dining room that could have entertained all the guests in the resort. This used to be the owner Lisa Harper’s unit. She left her corporate life as a CEO of children’s apparel company, Gymboree, and moved to Baja California. She purchased the land and soon built 12 luxurious suites. Later, she built 16 more to keep up with the demand of guests searching for a boutique resort near the waves. 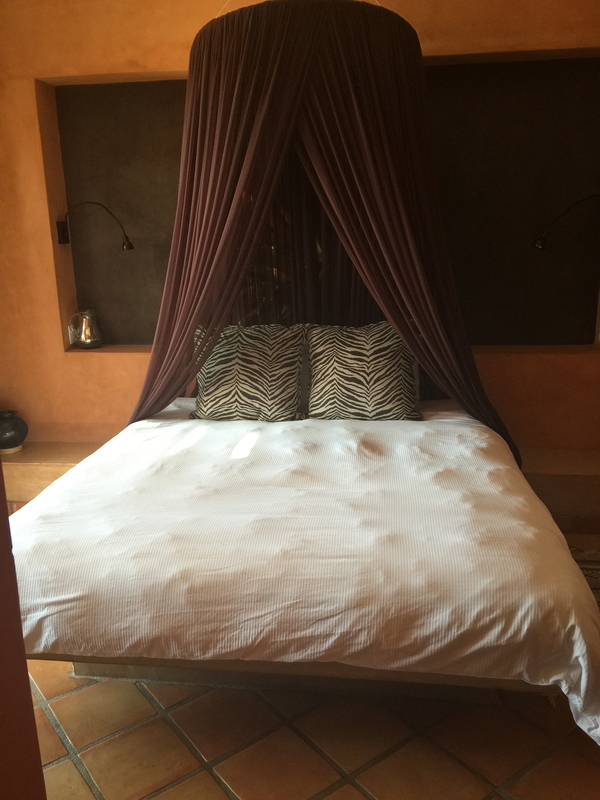 Most of the suites have king-size beds, with mosquito netting creating a romantic vibe. The bathrooms have huge concrete soaking tubes and an open shower with his-and-her shower heads. Out on the palapa-covered patio are two comfy lounge chairs, a day bed and dining room table for eating al fresco. Best of all, there are no televisions or telephones. 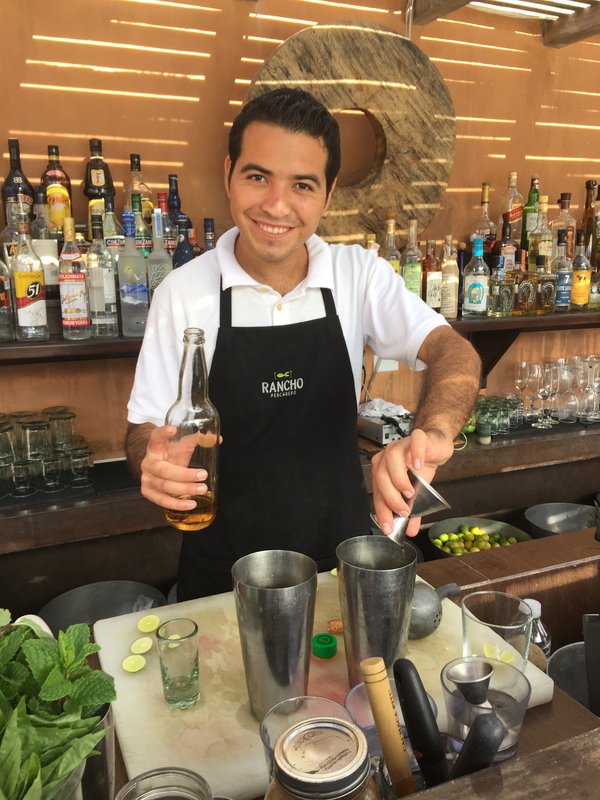 Guests receive a complimentary welcome margarita by the friendly bartenders. Afterwards, guests don bathing suits and swim before sunset. Before nightfall couples take long walks on the beach to collect shells and admire the driftwood, while the sun sets into the Pacific. The resort has an open-air Garden Restaurant built near the organic garden. Many of the ingredients on the modern Mexican menu are harvested from here. The selective wine menu offers glasses and bottles of wonderful Mexican white, red and rosé wines. While enjoying pork cochinita filled in housemade corn tortillas with pickled onions and a chile puree, we learned that a culinary duo, Jeff and Susan Mall from Zin Restaurant, are due to arrive next week to take over the kitchen to continue the farm-to-table philosophy. In the evening, guests point out the Big and Little Dipper, Orion’s Belt and shooting stars, while sitting near the roaring fire-pit. By 9 p.m. the on-site Garden restaurant closes, and 9:30 p.m. the bar by the pool shuts down. This is not a Spring Break surfer destination with loud music, lots of beer and skinny dipping at midnight. In fact, children under 18 years are not allowed. 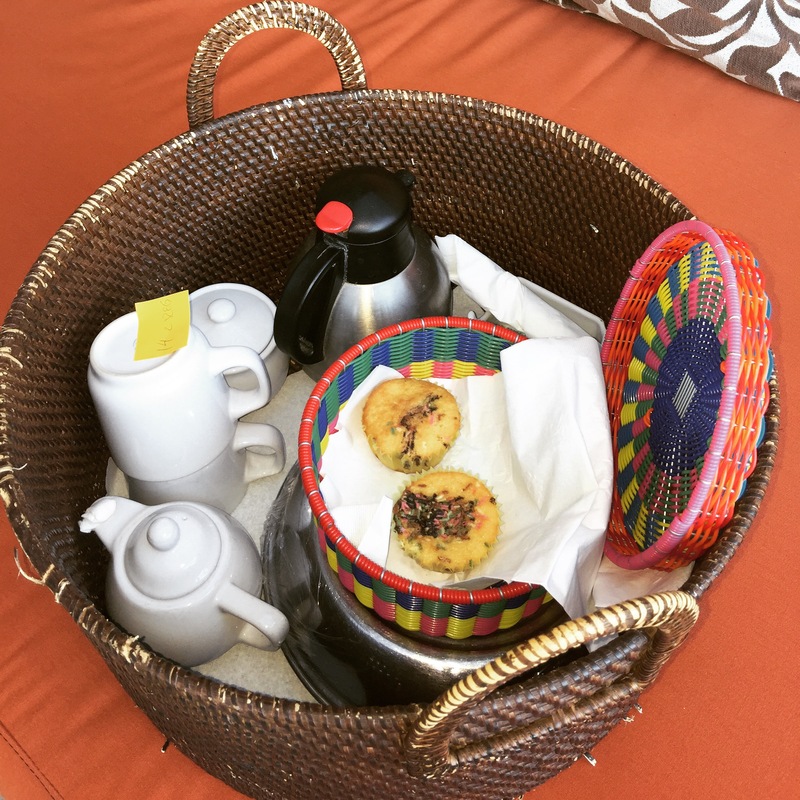 Staff members deliver baskets filled with fresh fruit, sprinkled rolls and coffee to the front door of each suite. Later, guests gather near the lobby for healthy breakfast plates of eggs and roasted vegetables on curry toast, before attending the complimentary 10 a.m. yoga class in the nearby yoga pavilion. Before check-out, couples take one last dip in the pool, before driving back to the airport. The resort provides magazines, sun hats and a variety of sunscreens at the poolside bar. Rancho Pescadero is a luxury, chic vacation destination that leaves guests with a new appreciation of Baja California Sur.